Cherkassky Zoya (b. 1976, Ukraine) Lives and works in Israel and Berlin. Immigrated to Israel in 1991. Studied at “Hamidrasha” School of Art, Beit Berl and at the School of Visual Theater, Jerusalem. Held solo exhibitions in Berlin, Moscow, the Tel Aviv Museum of Art and Rosenfeld Gallery, Tel Aviv. Recipient of several awards including the 2000 Ingeborg Bachmann Scholarship, established by Anselm Kiefer and the 2004 Chosen Artist of Israel, Cultural Excellence Foundation. 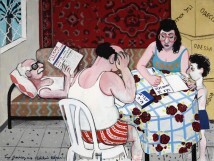 Her provocative artwork can be found in important collections in Israel and abroad.